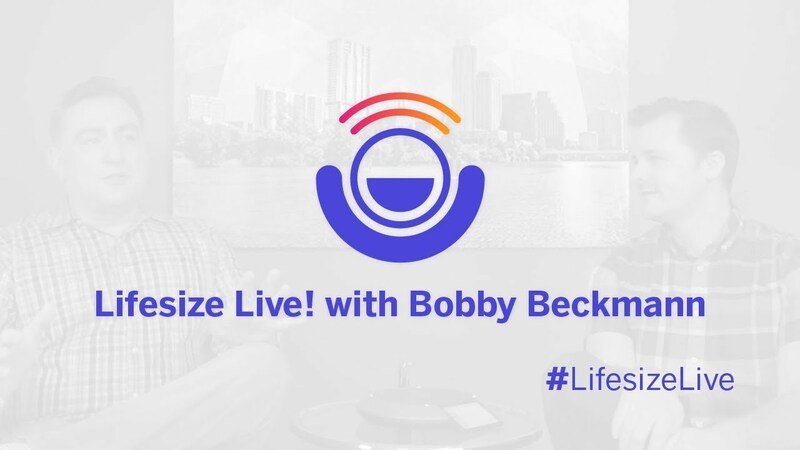 Hello, everybody, and welcome back to Lifesize Live! The live web show produced entirely through the Lifesize platform. I'm your host, Julian Fields, and with me today we've got our CTO, Bobby Beckmann. He's here today to talk about trends of video conferencing in the future. You got your crystal ball? I'm ready to whip it out here. Well, hello everyone. Couple of things I want to talk about today. The big thing you always talk about here is what does AI mean for the meeting room? When people think AI, they think sci-fi or robots or something scary, but it's a lot simpler than that. Usually, when it comes to the impact of AI, there's not a big boom where suddenly everything's artificially intelligent. There are a lot of small stages where little improvements actually make a huge change in how we meet. There are two big areas of AI and how I see them impacting our meeting rooms. One is machine vision. Machine vision is interesting because there are a few different things it can do: it can take a look at everyone who's currently on the call and pull stats and analytics about them in real time. So for example, you can imagine a virtual classroom where you have one professor talking to 50 students all at once. There's no way for him to judge the engagement of every student in his class. If you're in a real classroom, you can feel the buzz. You can determine if they are actually paying attention, but virtually, you don't know who's really engaged. So it'd be great if we could have some sort of service that would take a picture of everybody and instantly tell me how they’re feeling — are they happy, sad, bored, angry or getting riled up over something you're talking about? Yeah, smile detection. So imagine if I'm looking at this screen of all these 50 people, but over here to the right I can see in real time the sentiment of this phone call or this video call and how it's going, and maybe I change my delivery in real time. Or maybe I change how I deal with people later so if I'm a salesperson and I'm doing these calls all the time, I can judge the sentiment of my customer and learn how quickly they will buy or how much they will spend based on that first initial emotional engagement versus just blindly selling them a bunch of features. Okay, that sounds like a real benefit there. I could be hosting a meeting with my team, and getting their engagement is one thing, but talking to a potential customer and actually being able to act on that is totally different. Yes, so there's real benefit and real ROI. It's going to be interesting, and I think there are pieces out there today that will let you do that. You're able to take those snapshots and send them to big cloud services and get a lot of data about who's currently in the frame and what their mood or sentiment is. The other part to machine vision is just being able to know what is in the room. It takes a lot of work to build white board cameras and have separate ways of sharing data, but if you have a couple cameras up there, you're able to look at the entire room. If I know I'm walking up to a white board, there's nothing to stop us from taking the data from the white board and cleaning it up and making it a presentation. It makes it way easier to conduct presentations or conferences to be able to do that automatically instead of having to physically go over and flip the switch and point one camera or turn a different camera, and then all of a sudden everyone on one side of the frame is forever off screen because they forget about moving it back or you hear a lot of "Oh, I'm on the white board so you can't see what I'm doing right now." And it sounds like if the technology is rebuilding the information, then it's saving it so you don't have to take photos of it at the end of the day. So it's part of the meeting, and if you record, it's part of that. I think that's real interesting. When you start to get to some of the more esoteric machine vision things that are further out, it’s the identification of people that are on there — being able to walk into a room and immediately know who's in there. So imagine if you're meeting with ten people, you know all ten people who are sitting in the room or you know who the meeting owner is. I walk into a room, and I don't have to do anything: it instantly knows who I am, camera pops up on my screen and greets me, and I just start my meeting without having to do anything. I know we talked a lot about audio conferencing, and it's like, “So-and-so joined the meeting” or “Who just joined? Who just joined?” and you hear this over and over again. It sounds like this takes all of that out of the meeting and you're just able to see exactly who's in the meeting. Yeah, you can take a look when we have individual participants on Lifesize and you can see every one. But when you are looking in the conference room with ten people and you only know three of them, then it'd be great if you could just mouse over everybody in the room and learn a little bit about them. I can identify them, and maybe their LinkedIn profile shot pops up. Now sales has another tool! Yeah, like who am I talking to? Is this a buyer or a guy who’s going to give me a hard time? Or do we have the CTO in the room and he wants to hear more about the cool features? Exactly. So I think that's the vision part of it. I think that's going to be a big thing, and I think you see parts of it already showing. They're already real time, and it just takes integrating them and finding the right business cases and rolling them out. The other part of AI is the voice side and the transcription side. They've been coming along, and now you're starting to see a lot of virtual systems. Everyone's very familiar with the Alexas of the world where you can kind of give it a command and get a response. I think what you'll see in the next wave is these machines actually listening to the whole meeting. You invite them into the meeting, and they show up and listen to the meeting and they listen for actions. So they are the ones taking your action items. They are listening to you say, "Hey, send me this presentation." Okay, well, they can actually hear that and distribute the presentation to everybody. Right. And so once you can search things and categorize them, then you can start to analyze them and drill into them the way you can drill into written words today. It should become another source of data. That's going to be a productivity enhancement. It rates the meetings for you so you can go back through your archive of the meetings. This is cool. This is awesome. Yeah, there's a lot of cool stuff, and it's not far away. I'm not talking about this happening in 2025. I’m talking about this year, 2018. So AI is a cool part, but you also have to make things work. The big initiative for us is just interoperability. People have devices that are brand new or old that are incredibly good, and they don't want to get rid of their infrastructure, but they want to be able to use them. And I think a big push for us this year is to have everything work well together. You know, a lot of times you'll have earlier-on interop barely working together. So I might be able to join the call if I spend ten minutes trying to get this thing to work. Yeah, and I think we want to get to the point where we always want you to bring Lifesize gear because we like Lifesize gear, but there's other gear out there and if you want to plug it in, we want it to work just as well. We want you to have a great experience with your meeting no matter what you're using. And I think that's going to be important for all collaboration because you don't know what people are going to use to collaborate. If I'm using a ten-year-old codec, one person is using their mobile phone, and someone’s on their desktop or laptop on vacation, the meeting shouldn’t have to stop. There's a cool little snippet of somebody on a ski slope, just sitting there and actually connecting — they're having a great experience with the meeting. So I think the interop of all devices, new, old and in different ways, is a big thing for us at Lifesize, and I think we're seeing that in 2018. What else are we doing? Well, there's 4K. 4k is just an easy buy — I can't believe I have a 4k monitor on my desk now and it cost 500 bucks. I think for years I wanted my Apple cinema display because it was the Cadillac of these things, and now, that doesn't look as good anymore. This was just a $500 display, but I think you're going to see it everywhere and it looks fantastic. 4k is where we want to go. We want to see what 4k presentations look like in 4k with 4k cameras, because as these monitors roll out, you're going to want to use them. And the only way they're going to make any sense is if you have great sources. The next step beyond face to face is being able to see every pore in your face. “How could they have actually watched that?” And I think as you start to see the 4k video, it's just upscaling and it looks okay, but when you see the 4k sources on a 4k monitor, it’s incredible. I mean, you really are getting to the point where it's unbelievably just a good experience. I think we're running close to time. I don't know if you have any last departing thoughts on what's going to happen this year. I think lots of companies are building really cool things, and Lifesize is one of them. And I think the great thing about it is that we want to see what the great things are and make them work together. So I think you'll see a lot of good movement forward by everybody. It's always fun to be a part of it and see what we can build in 2018. Well, thank you so much for joining us. I notice you didn't say teleportation is going to happen this year, so in the meantime we've got video conferencing. Enjoy it; enjoy the best that's going to come this year. We are working on that by the way. Okay, good, the special teams. Thanks, guys. We'll see you next time.